ABC15 investigator Dave Biscobing has been tracking down those practicing medicine and putting patients at risk for several years. 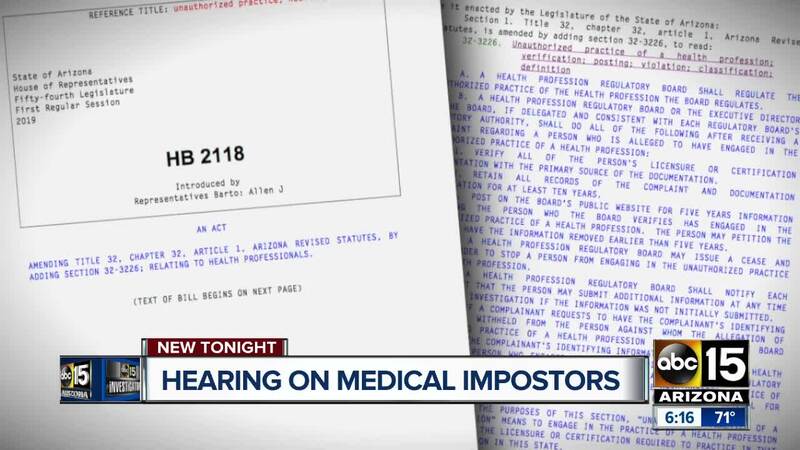 PHOENIX — A bill to increase accountability and transparency for how Arizona’s health boards handle cases of medical impostors cleared its first hurdle through the state legislature. During the hearing, Barto and other lawmakers cited several portions of ABC15’s reporting. The station’s investigative unit has spent more than two years reporting on impostor health professionals. In all, ABC15 found there have been more than 130 individuals officially questioned, accused, and/or found to have participated in unlicensed practice of health since mid-2012. HB2118 specifically addressed many of the loopholes and problems exposed in ABC15’s documentary. - Regulate the unauthorized practice of the health field the board oversees. - Verify complaints of unlicensed practice. - Retain all records of the complaint and documentation for 10 years. - Post on boards’ public websites, the names of people who have engaged in unauthorized practice. - Set the criminal penalty for unauthorized practice to a class 5 felony. - Refer verified complaints to county attorneys or the Attorney General’s Office. So far, there is no official opposition to the bill. Several associations that represent different health professionals have signed on in favor of HB2118, including ones for physical therapists, nurses, and osteopathic physicians. A lobbyist for insurer Blue Cross Blue Shield also approved the bill. Barto also said that nearly a dozen health board directors met with her before the bill was introduced to discuss issues and work on language to specifically address problems. “There’s widespread agreement that there is a problem and this needs to be fixed,” Barto said. A few members of the health committee had minor questions about the language in the bill, including Rep. Amish Shaw, a physician, who worried that real medical professionals could face unfair consequences if they simply forgot to update or renew their license. However, a representative for the state nursing board responded to his concern by saying board have administrative processes to address minor issues like that. All six episodes of ABC15’s documentary series “Impostors” are available now on the ABC15 channel on the following streaming devices: Roku, AndroidTV, AppleTV, Amazon Fire. It will also launch soon on Amazon Prime. For more on the ABC15 Impostors series, CLICK HERE .